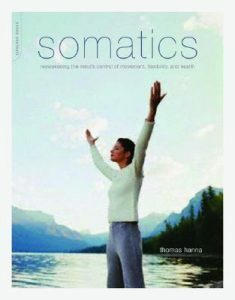 Somatics is a term coined by Dr. Thomas Hanna to describe a field of study and practice that focuses on a person’s own ability to use internal awareness to improve physical function. Based on his studies in neurophysiology, biofeedback, yoga and the Feldenkrais method, Hanna devised a self-care routine he called the “Daily Cat Stretch” which he presented in his book, Somatics: Reawakening the Mind’s Control of Movement, Flexibility and Health (1988). Habitual muscular tension is at the heart of a wide range of health problems from chronic pain syndromes such as backache and headache to a variety of arthritic complaints. We know muscles have no will of their own, so we can see that the problem lies not in the muscles themselves, but is instead a consequence of deficient regulation and control. This functional deficit in the nervous system’s management of muscle function represents a lack of voluntary control that cannot be remedied by any amount of structural reengineering. Change must come from the inside out. In other words, the illnesses of hypertonicity are not medical problems needing treatment, but instead are sensory-motor problems requiring somatic education. Since studying with Dr. Hanna in 1990 Dave MacDougall has taught the “Cat Stretch” and other somatic exercises to over 3000 people desiring to prevent or eliminate chronic muscle/joint pain and stiffness. ← One Roof Welcomes Clinical Psychologist Dr. Dana Lau.